After 4 years, 9 months and 23 days of dating, Tim Choi proposed to Edith Ho on August 15, 2008. She said "yes" at exactly 8pm PST. We're excited to share our proposal story with you in its finest details. In reading our story, we hope you'll be able to partake in our excitement of our happy day. [Tim] � I began brainstorming for this engagement in May/June of this year. I knew that there were two critical elements that must be present for Edith to say "yes": 1) it must be a surprise; 2) it must allow her to share the joy with friends and family either in person or by phone. With these requirements in mind, I decided to plan a huge surprise locally so that her friends and family can attend. From my perspective, I had just one requirement � I wanted us to dress up for the proposal. This logistical piece has to be incorporated into the surprise. [Edith] - Believe it or not, these are extremely difficult requirements for Tim to meet. First, it's next to impossible for him to keep secrets from me. Second, I think I have telepathic abilities to read his mind. Of all his countless endeavors to surprise me in the past (all of which I fully appreciate), I can count the truly successful ones on one hand. [Tim] � To allow friends and family to attend our engagement party, I decided to organize a get together at the Lucille Stern Community Center after I propose to Edith. 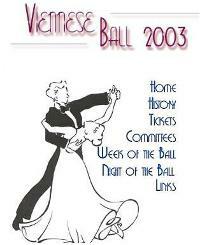 I wanted to recreate the ambience of the Stanford Viennese Ball at Lucille Stern Hall because it was at this ball in 2003 that sparked our romantic connection. I selected August 15th as it was one of the few days available in the summer at Lucille Stern. The question of "where do I propose?" was another challenge. I talked to friends and scoured through the internet for blog postings and suggestions on "most romantic place to propose", but nothing came to my liking. Until�I remembered a promise that Edith made when she was a freshman at Stanford. Although she biked by Hoover Tower (the famous tower in every picture of Stanford University) everyday in college, Edith had never visited the observation deck because she wanted to share that special moment with her first boyfriend. Well, I am her first boyfriend but we had not had an opportunity to visit the tower yet. Bearing the significance of her unfulfilled promise and the symbolism of our shared college experience, Hoover Tower became a top choice. I visited the tower at lunch. It was perfect � a beautiful panoramic view of campus and a clear view of sunset. I knew at that moment that this was THE place. There was just one problem. 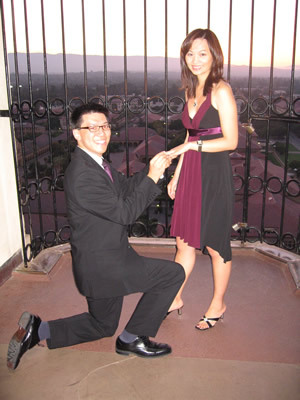 I wanted to propose at sunset (around 8pm) but Hoover Tower closes at 4:30pm on weekdays. I also wanted the occasion to be a private one without swarming tourists. So, I proceeded to speak with the Hoover Tower security manager and asked for permission to re-open Hoover Tower at 7:30pm. 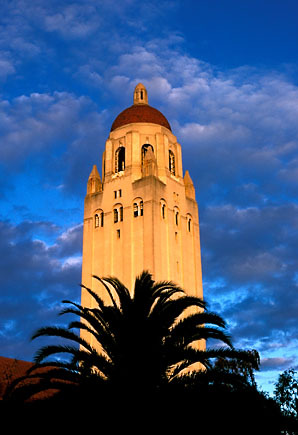 She was reluctant at first, stating that Hoover Tower is a private institution with confidential government documents. However, after much discussion, she kindly agreed. [Edith] - I did not suspect that Tim was going to propose because I knew that he would have to ask my parents for their daughter's hand in marriage. Unbeknownst to me, Tim took a secret trip to Hong Kong in July to visit my parents. I will spare you the details. But in brief, my parents were surprised to see him. Tim took a minor beating from my dad while wearing a full suit in 99 degrees Fahrenheit, full humidity Hong Kong weather. But in the end, he got their permission. [Tim] - Now, there were five people instrumental to the planning and execution of the event. 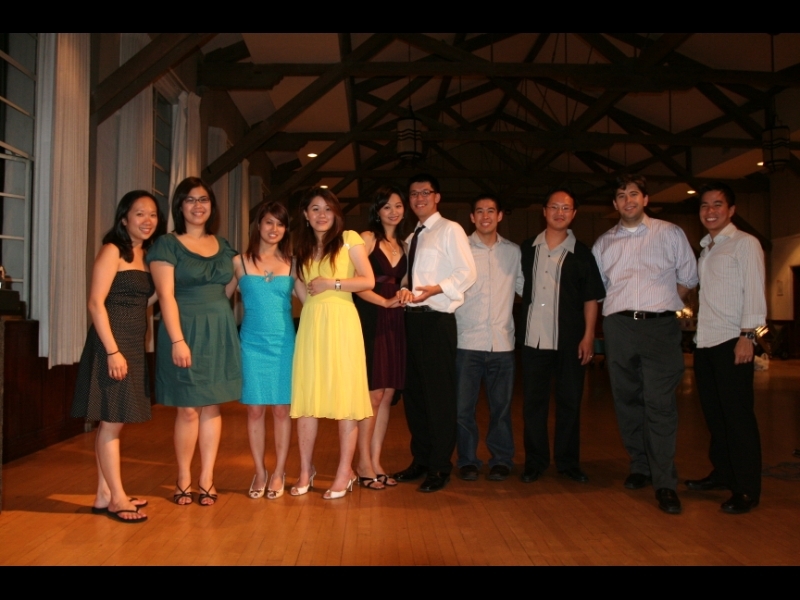 Enoch Choi, the master organizer; my sister Christina, the food connoisseur; Sandra, the logistics expert; Nicole Kang, the intelligence of Edith's preferences and guest list; and Tony Dorie, the chief music and audio guru. [Tim] - How did I set up this surprise? Two weeks before the proposal, I told Edith that my company was having our annual party on August 15 and that I really wanted her to come. I also told her that it was a formal dinner/dance event and she had to get dressed up for it. Edith said that she would look into it, but she was not sure whether or not she could get out from work on time. In response, to avoid a scheduling fiasco, I contacted her boss who agreed to let Edith leave early from work on Friday. Sweet!!! To reinforce the company party story, I created a fake company memo the day before the big day. This email detailed the events on Friday. [Edith] - If it wasn’t for the email, I would have started getting suspicious about the evening. Tim cleverly threw me a curve ball by suggesting that we did not need to go up there, which also deflated my suspicion. Honestly, when I found out that the cocktail party was at Hoover Tower, I wasn’t that excited. I had made a promise that I wanted to share the experience with my first boyfriend, and not with a bunch of strangers. In any case, I knew that this company event meant a lot to Tim, so I decided to go. Without knowing that Tim had arranged it with my boss, I was pleasantly surprised that my boss let me out early! [Edith] - My boss kindly dismissed me from the hospital early that day and I rushed home immediately to change. When I opened my front door, my roommate Liz screamed, "Edith is back!" It was the first time I had ever been greeted with such exhilaration!! My other roommates described Liz as "not herself" that day, so I didn't think too much about it. I found out later that Liz was had dressed up for my party at Lucille Stern and was not expecting me to come home. When I told my other roommates, Joyce and Charlene, that I was going to Tim's company event, they became exceptionally generous, lending me their favorite dresses and doing my hair/makeup. I felt love all around, but wasn't quite sure where it was coming from. [Tim] - I picked up Edith at 7:30pm after she got ready. While in the car, I pulled out two fake "admission tickets" to the cocktail party. It was printed professionally with my company logo on it - making it look like an official invitation pass. I then drove over to Hoover Tower, trying my best to remain calm and cool. As we exited the car, I carried the photo book that I had created. To disguise it, I hid it inside a US Postal Service package addressed to the InfoComm Development Agency Singapore. Edith asked about the package and I told her that my colleague wanted me to bring it to him. [Edith] - The tickets were a smart idea. It singed any brewing suspicion in my mind. As we were walking to Hoover Tower, I was surprised by the absence of music or chatter from the tower. A security guard greeted us at the tower entrance and Tim handed him the tickets. He studied the tickets, smiled, proceeded to lock the front doors (*strange*), and then led us to the elevators. Again, dead silence. I was starting to get suspicious. Ding� the elevator door opened. In front of me was a breathtaking view of the majestic sunset over the Stanford campus. The air was sweet and crisp. I initially followed the security guard, who was actually searching for a corner to hid, but pulled me back to the other side of the Tower. [Tim] - I then suggested opening up the United Postal Service package. Immediately, Edith objected, "No� that's illegal... we can't open someone else's package!" Without hesitation, I ripped the package and showed her the photo-book. [Edith] - I knew something was up. We browsed through the photos and reminisced about our journey over the past 5 years. I loved the book! It included Tim's "Top 10 reasons of Why I Love You", our first movie stubs, our first letter exchanges, and ICQ messages. The last section of the book depicted Tim's "Top Five Surprises". Something was really up. Can this be it? My heart was pounding. I arrived at the last page of the book which was the final surprise. The last page read, "Will You?" At that moment, Tim kneeled down on his knee and pulled out the ring. I was shocked and speechless! While kneeling on one knee, Tim began to recite his romantic proposal speech. I was in such complete delirious and elated state that I started laughing to the point of keeling over. All I could fully comprehend was sound coming out of Tim's mouth but his words did not register with me. I was too overwhelmed with emotions! Before I knew it, his speech was over and Tim concluded with "Edith Ho, will you marry me?" With an exploding mixture of joy, shock, and nervousness exhibited in incessant laughter, I could not gather my senses to say "yes". Plus, I did not even hear the speech at all. After a long pause, I asked, "Can you repeat that again?" [Tim] - Thinking that she wanted me to repeat the question, I asked again, "Edith Ho, will you marry me?" She promptly replied with, "No, no� I mean, can you repeat everything again?" Taking a deep breath, I proposed the second time. [Edith] - This time around, I tried very hard to pay attention, but I could not stop laughing completely. I was able to make sense of only half the speech. Before I knew it, Tim reached the final question again, "Edith Ho, will you marry me?" I paused. [Tim] - Now, I was pretty much freaking out because it looked like she was having doubts and I didn't know if she was going to say yes. I was still on my knees and I was starting to lose feelings to my legs. [Edith] - I tried my best to sort out my emotions, but I still could not summon a "yes". At the least, I wanted to hear Tim's full speech. "Tim, can you repeat it one more time?" [Tim] - Again, I took a deeper breath, and gave my speech one more time. [Edith] - Restraining my emotions, I stayed quiet. I looked him in the eye and soaked every word in his speech into my soul. At the end, he asked "Edith Ho, will you please marry me?" I was ready. With that, I replied with a confident "YES!" and my answer was chorused by the bells at Memorial Church. It was 8pm. Tim put the ring on my finger. It was unforgettable! [Tim] - Definitely, it was one of my happiest moments of my life. The security guard appeared from hiding, and took pictures for us to capture this special moment. [Edith] - When Tim told me that we were heading to the real Voltage company party, I had an inkling that this was yet another "surprise". To test my suspicion, I asked Tim to call Ray, his boss, to let him know that we were on our way. Tim called Ray in front of me and I heard Ray on the phone. Now, realizing that I was actually attending a company event, I felt uneasy and a little frustrated. I preferred to spend the night sharing this exciting news with my friends and family. Plus, I was still stunned and speechless, and not in the right mind to socialize with his colleagues. However, I knew that Tim really wanted me to go with him to the annual company function, so I went with Tim. [Tim] - I decided to play along with her frustration by saying "Well, maybe, we can call your friends at the party � I can try to organize some event for tomorrow� sorry... we do have to go to this work event..."
We then drove to Lucille Stern Community Center. The lobby was decorated with my company logo and marketing material� an additional touch to throwing her off. [Edith] - A gigantic Voltage company poster stood adjacent to the closed front doors. Tim and I walked up together and Tim swung the doors open. To my complete surprise, I was standing in front of 80+ friends who were eagerly waiting for our arrival! Tim and I were thrilled to share our story with our friends right there and then! Tim planned the perfect way to celebrate our special night on August 15th � better than anything I could ask for! [Edith & Tim] - We're very excited to be engaged. For those who were there, your presence meant a lot to us. For those who couldn't make it, thank you for your hearty congratulations!